Beyond the coming decade, the fiscal outlook is significantly more worrisome. 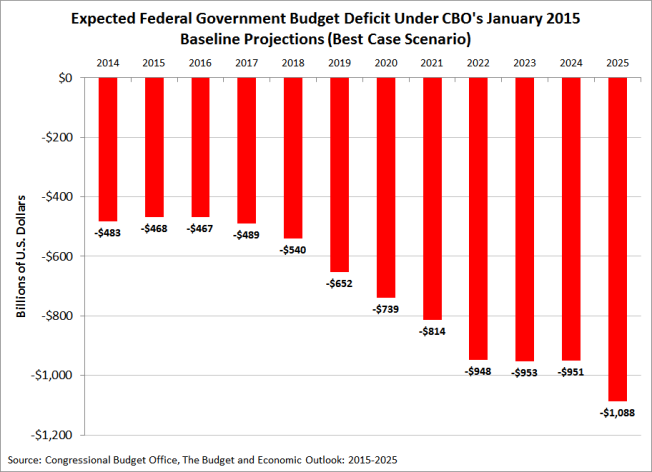 In CBO’s most recent long-term projections—which extend through 2039—budget deficits rise steadily under the extended baseline, which follows CBO’s 10-year baseline projections for the first decade and then extends the baseline concept for subsequent years. Although long-term budget projections are highly uncertain, the aging of the population, the growth in per capita spending on health care, and the ongoing expansion of federal subsidies for health insurance would almost certainly push up federal spending significantly relative to GDP after 2025 if current laws remained in effect. Federal revenues also would continue to increase relative to GDP under current law, but they would not keep pace with outlays. As a result, public debt would exceed 100 percent of GDP by 2039, CBO estimates, about equal to the percentage recorded just after World War II. Such high and rising debt relative to the size of the economy would dampen economic growth and thus reduce people’s income compared with what it would be otherwise. It would also increasingly restrict policymakers’ ability to use tax and spending policies to respond to unexpected challenges and would boost the risk of a fiscal crisis, in which the government would lose its ability to borrow at affordable rates. Moreover, debt would still be on an upward path relative to the size of the economy in 2039, a trend that would ultimately be unsustainable. To avoid the negative consequences of high and rising federal debt and to put debt on a sustainable path, lawmakers will have to make significant changes to tax and spending policies—letting revenues rise more than they would under current law, reducing spending for large benefit programs below the projected amounts, or adopting some combination of those approaches.